P neumatic transportation uses compressed air for propulsion; air is blown through an airtight tube, propelling a capsule, canister or other vessel. It has had some success, although efforts to use it to transport people have failed. Pneumatic transportation dates back to the 1860s, when engineer T.W. Rammel won a huge contract with the British Post Office for a network of pneumatic tubes to carry mail throughout London. By the turn of the century, New York City had an extensive system that moved letters and parcels in a loop around Manhattan, with an extension into Brooklyn. Enough pressure was used to propel a canister containing 700 letters at 30 miles per hour. Boston, Chicago, Philadelphia and St. Louis all employed pneumatic systems for mail distribution. By the 1950s, all of the systems had been abandoned in favor of newer technology – trucks. Pneumatic systems on a smaller scale were used in retail stores, where a salesclerk would forward a customer’s money to a central cashier in a small canister; change and a receipt would be returned via the canister. 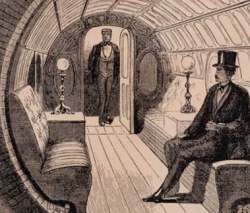 A pneumatic system to transport people was developed by Alfred E. Beach in New York City in 1870. Using his own money and operating in secrecy, Beach managed to dig a block-long subway tunnel right across from City Hall. A huge rotary blower, dubbed the Western Tornado, produced one hundred thousand cubic feet of air per minute and drove the subway car at about ten miles an hour on a gentle cushion of air. The public clamored by the thousands to pay $.25 to ride the pneumatic subway which featured a luxurious car, complete with upholstered seats, oil paintings and chandeliers. While it captured the public’s fancy, the high cost of producing enough air to transport trains, along with the difficulty of controlling the pneumatic power for the frequent stops needed for a subway line, doomed Beach’s effort. Such economic and technical failures are common to transportation futuristics. Previous failure did not deter Lockheed engineer L.K. Edwards from trying to resurrect the idea of a high-speed tube transport in the 1960s. Lockheed eventually decided to drop its research in this area, but Edwards persisted, forming Tube Transit, Inc. to exploit “gravity-vacuum transportation.” He made presentations to federal and local transportation officials extolling the virtues of his concept, but his pneumatic subway ultimately was no more successful than Alfred Beach’s. Pneumatic transportation survives today as a means for moving commodities, usually through pneumatic capsule pipelines (PCPs). Research is focused on developing larger diameter pipelines with greater capacity, but the problem of how to compete economically with freight movement by truck or rail persists.